Directions: Park at Lakeview Park in Lorain, Ohio. Take the path down to the beach. 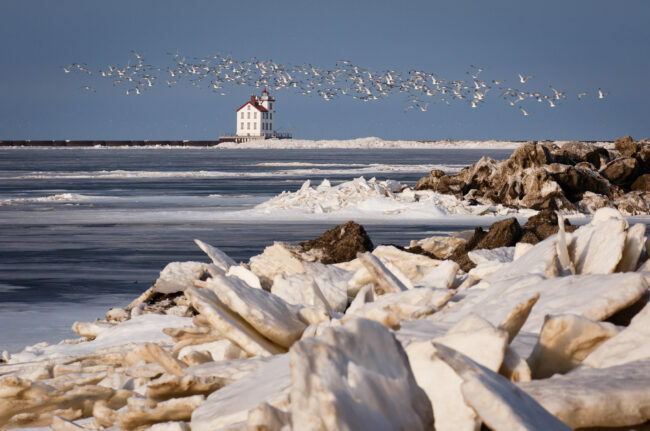 The Lorain Lighthouse is an iconic but unusual structure. Rather than follow the typical cylindrical tower pattern of most lighthouses, Lorain’s light was contained within a “beacon building.” Lorain West Breakwater Light is no longer a functioning lighthouse, but it is still an interesting photographic subject. We were there in January so part of Lake Erie was frozen, which added interesting angles to the foreground in my photos. The lighthouse is actually quite far from the beach, so you will want to use the longest telephoto you have. This photo was taken at about 200mm, but even when I zoomed in to 500mm the lighthouse still didn’t fill the frame. I was there in winter, but any time of year would be nice. Choose a clear day and be there early in the morning or late in the afternoon for the best light.